I've made an appointment at the end of July to have my teeth extracted - seven of them. Not all of them, yet...it seems to include the ones that are hurting me so much. I've had a very hard time sleeping the past week -- worked all but one day when I stayed home to try to figure out what to do with all of the reactions. Their pain medication isn't working for me - spending hours pacing, taking hot baths to reorient the pain - cooking myself on a heating pad etc...back to OTC stuff until Monday, at least. Sunday I have off -and maybe I'll find some sleep as well. 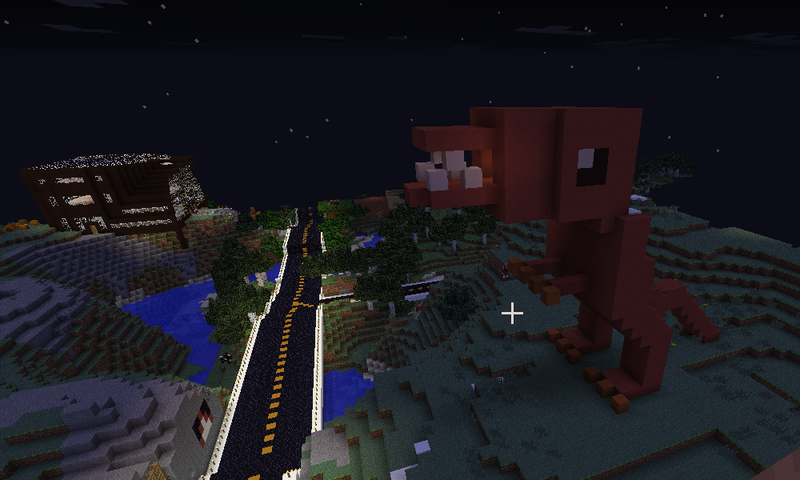 In the meantime, Esme and Daddy play Minecraft and build lots of things. We've watched some episodes of Emily of New Moon when I get home from work. Esme hopes I'll be able to play more with her soon....me too. Esme comments on New Moon - What is the purpose of the show? Every child has a destiny. Except the Emily child - she has to work for hers. //hmmm... interesting point of view. She has really started to pay attention to some of the comments, and how Elizabeth's restrictions effect Emily and everyone else in the household. Capture this before it passes me by. I have seen Esme grabbing cards off of our bulletin board -ones sent by her great aunt and others, and reading bits of them, and putting them back. There is an element of 'you didn't tell me to read that' in it.. curiosity... and sometimes I see her expression flicker and I wonder what she has found. I an glad to see it. And she has been scanning the spines of the books on our non-fiction shelf -and saying she has seen those before. I told her she could take any book from that shelf and look through it, even if all she wanted to do was look at it for a minute... or read a lot, as long as she takes care of it and puts it back. She said she thought those were our books, so she had been leaving them alone. We said she could look at any book in the house -if it was fragile or looked very old we would appreciate her asking for help with it. I wonder if that would be a good time exercise for homeschool, too, a day or two here and there ...pick anything you want to look at - and get to know what is in the shelves. We have so many books - it can be intimidating! And as I mentioned before - she has always taken books sort of 'for granted'...seeing any curiosity is a good thing. Last night she read a page or two of the chapter in Little House in the Big Woods I had been reading to her. She really wanted to get up and run around the room in laps. Mark was a bit exasperated by this behavior. I know she is getting some out of reading this- but it doesn't use up all of her energy..and she has been having huge bursts of energy whenever I get home she just can't sit still etc... something we need to work on and figure out what is the best method. We went to the flea market this morning, and bought some more wool, some vegetables, and saw goats, chickens, ducks and more. I woke up and wandered the world for a few minutes just as the sun was coming up. It is my yearly tradition. I saw the flowers that were blooming and was invited by our dogs to chase rabbits in the long wet grass. I felt a little like a Highland lady walking along the road next to the misty valley with my blanket thrown over my shoulder and a long skirt skimming the wet leaves. Then I had a bit of a nap until Esme came bounding upstairs wanting to have all the presents opened immediately. She didn't understand (couldn't fathom at all)why anyone would want to wait a single minute. We cut the cake about noon, and brought a piece up to Grandma about two. We had planned to spend a nice day at home and try not to get really hot. Some sad news happened while we were there talking to Grandma - our sweet dog Loula was hit by a truck on the road. They probably would have all been home if we hadn't been out visiting ourselves. Mark did the necessaries for her - he said we didn't want to see.... I will miss her. Esme will miss her, too....she is more worried that I am sad about it. A sad thing in such a nice day. My dad gave me a call and Gale also left me a message on Facebook. Soon after this I ushered her off to a bath, bed, and finished telling her the fairy tale of the Snow Queen. Watching 'Idiocracy' : Esme says: "I need to see their inventor person. Maybe he isn't living anymore. That would be bad - they need one, because they don't have good ideas. And they need to learn how to spell hospital, and get non-green water. Their machines don't even work." How many times have we watched this and she hasn't commented on it at all? Talking abut numbers while she washed her hair in the bathtub...it's millions, then billions, then zillions, then gazillions. and a googleplex plus one? It's just like the Earth. The Earth is always getting bigger,all the time. (me: That could be. Scientists are working on that). And the smallest number is zero, then, because it is nothing at all. (me: No, - zero is zero. Nothing added, nothing taken away - balanced. OK...do you want a frog? I have a frog. I'll leave this with the very first picture we had of Loula, from Christmas Eve, 2011, and one from when she grew up into one of the best dogs we have had-- a 'classic all-around' dog. Poor girl. The weekend is coming up - Father's Day and my birthday. Mark got a steak :) I have a cake to bake with Esme tomorrow. Not much going on today - finished reading the Emily series in book form, and started reading some of the kids poems and stories that I had downloaded earlier. I adapted a very old book of poems from 1899 to use for her homeschool next year - some cute things there and I can add illustrations. There are several witty puns and topics (birds, squirrels, cats and dogs) she will be able to relate to. Esme read us her bird book from the library today as incentive towards playing bird with her in Minecraft for a while. She read very well - and only missed some rather large words- like clamoring, territory etc... I wanted to mark down that I heard her read a lot of new words with understanding -- the level I thought she was at is confirmed. When she is interested in the subject the book isn't 'too long' either.. as long as there are some pictures. Dress info: I used Butterick 4543 in size 7 with alterations. I made the front bodice a double-thickness for the facing...no way it can pop out and be visible like her herringbone dress has been bothering me with. 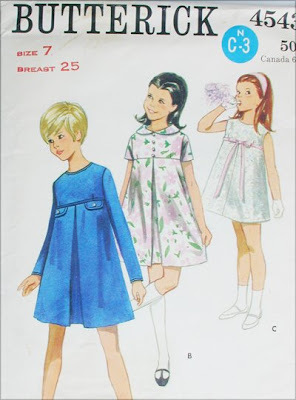 Her dress looks like view C with short sleeves, no inverted pleat in front or flaps or collar. I did pleat the skirt and sleeves-- it is my make-do, but it works. The zipper remains to be sewn in by hand - but other than that it is done. I tried it on her before I set the sleeves and it seemed to fit her just fine. Esme has been very artistic today. She has drawn a beach scene (hint hint to Mama - she put me in the picture under an umbrella reading my Kindle, so she could play with the kids at the beach). And the other drawing pictured is a tree that is a home for cats - and she left room for me to draw something on the other side. I made a school house and the kittens are all marching to school. That brings to me something she said yesterday. We had bought a clearance geology kit and put it up with her supplies for next year. She asked when we are starting school again. I told her August 2nd. She said 'Why can't it be August 1st?' She dived into 'summer projects' making decorations with stencils and markers and her drawings today. 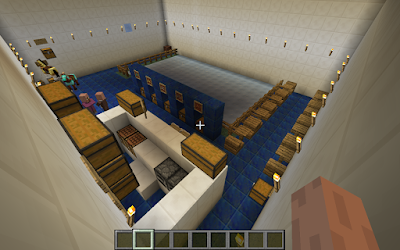 She wants to work more in Minecraft today again - making another house by the bank in Freeway world. In short, she is starting to want to 'do things' a bit more ...especially when Mom is home on her days off. We went to Murray, KY today - to see the oral surgeon for my wisdom teeth. They gave me the news, not quite as bad as what I thought it might be...but still, it will take some planning to do what, to them, must be done. *Sigh* Onward. I had wanted a 'red calico' print with some blue in it.. which turns out to be hard to find. Out of all of their stock, this was about the only thing that fit the bill. I had searched our local place as well and not found anything that satisfied the idea. 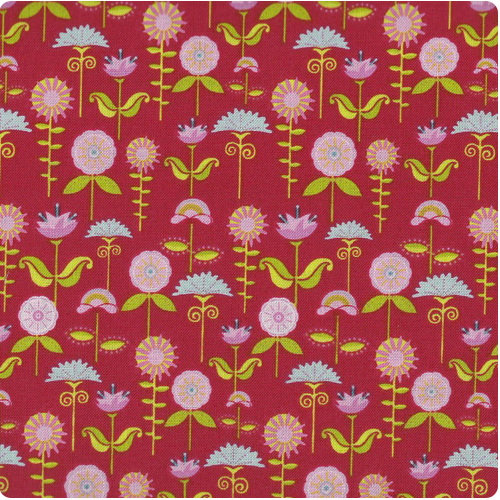 Esme had pointed out several bright pink monstrosities that could have bee made into something nice...Mark indicated a pattern full of purple and green squirrel silhouettes (which would have made awesome pants) but my heart was set on a 'timeless dress'. I have never made anything as beautiful as her Navy blue dress with Pockets, which had a little rose motif on it. I have tried a few times to emulate it...but failed. The next decision on this one is to go with the apple green mixer print I have in my stash, or the bright red solid- for the skirt. 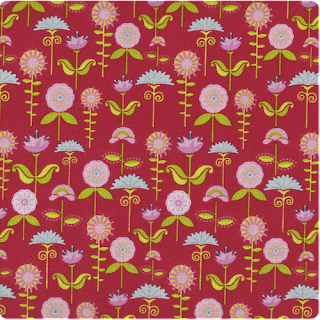 I imagine this for the bodice front and back.. one yard should do that. I have downloaded some English poetry in Amazon's free Kindle books - to browse after I finish the Emily Starr trilogy. She mentions so many of them in this series. I have read all of them here and there ...but never had them so closely at hand as to read them when I wished. We are home now, chickens fed and a relaxing night ahead of us. And I have tomorrow off, so there might be some time to sew. The fabric is washing and drying...I should go pick out a pattern as that takes me longer now that she is bigger than it ever used to. Esme has been building these in her Minecraft. She modelled them off a plastic dinosaur toy she has. This really shows where her natural talent lies.. she can just start and build something with an idea in her head given materials and tools she can use. 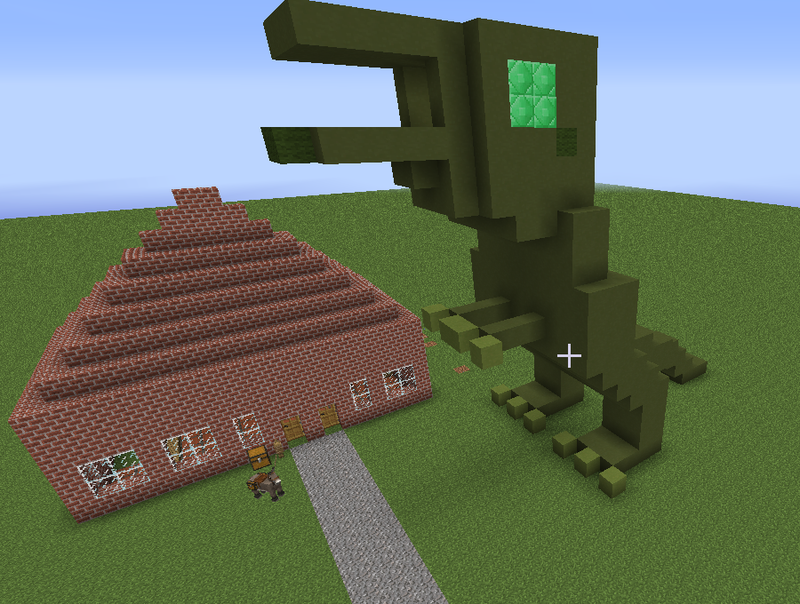 She named this world 'Jurassic Esme'. It even had small pools of water to the other side of the house that were dinosaur footprint shaped. This is in our shared world - Freeway world.. where we are all working together. I went out to the garden this morning and pulled in ingredients for a soup, which I took for lunch at work. I have been avoiding the garden some these past few weeks after all the weird weather made half our crops fail to thrive. But Mark is right- I'll lose what is producing if I keep feeling scorned and neglecting it. It also doesn't help that I am just so tired lately, Esme wants to play her games SO much (she is exhausting normally, but the undirected energy of no-school schedule in the day seems to exhaust me MORE not less...mostly because she gets prone to repetition and throwing stuff about randomly without something we forge ahead on) When I get up in the morning I am getting ready for work -and when I get home from work I hardly have much time before it is time for bed...I feel like I can't burn the candle at both ends to get anything done, and a bit stressed by the idea of starting things and not being able to finish them for days. We did read a bit more in our Little House book. She isn't into it - but I feel it is important she hears how life was that long ago. I do see some gears turning here and there - especially during the 'when I/grandpa etc were little' stories. I've also been scanning here and there for more resources for her science next year - as I feel that will get her excited in other realms. I am toying with the idea of making her a folder for the main subjects and holding her to finish what is in there (whether I'm here or Daddy is) and then she can decide what to do for the rest of the required time for the day. I asked her what she wanted to learn most next year and she said Roller skating tricks...and woodworking (making things with wood). And she wants to go the zoo again (She said that this morning when she woke up). When she did her journal entry today she said she was glad her writing was getting better and staying in a straight line now instead of going up and down all over. It really is the little things. I need to work on recognizing that, myself. Esme and I made Chicken Marinara last night - simple, but a good learning recipe. She quite enjoyed it, and with Mark's tomato sauce already made up, it was very good. Then we watched Mr. Peabody and Sherman, which she loved so much that we are watching it again today. We had a day out to town today - to the library and the playplace - as it was too hot for the park. Esme played with a lot of kids. I bought a few magazines and a book for her. She chose a bird book to check out with her card. On the way home we saw a mother deer and her VERY new fawn cross the road - it was so very small! 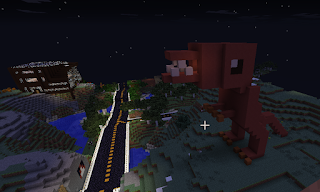 I'm not sure what we'll do later - we have been working on a new Minecraft world that centers around a blacktop freeway. We've put in a bank, a few houses, a swimming 'pool', a store and a pizza restaurant. We are centering around horses as 'cars' and setting up the 'parking lots' off the highway just like they are in a real town, except each having a fence post to tie up a horse at. I've started a new sketchbook...drew something halfway decent in it after Esme went to bed last night. I am halfway through reading Emily Climbs (the middle book of Lucy Maude Montgomery's Emily Starr trilogy) on the Kindle, and am thinking of how (or which) to tackle my thoughts on chemistry and math. If I could break out some time at night on my computer I could listen to some more Khan Academy where I left off last...or gather up my books and jot some relevant things in my sketchbook, which has worked very well for me in the past. Back to work tomorrow, and tooth exam on Monday. Esme's attempt to recreate the roller rink here in town. She built the rink out of ice so it really would slide. She has little chests in the blue area in the middle with item frames with boots, for the rollerskates, and chests underneath that with the diamond, gold or iron 'rollerskates' inside. The eating area is off to the right of the counter, just like in the real rink in town -and it has a high counter with stuff behind it, just like in the real place. Instead of the air hockey table, she has made a 'ride the horse' game, and instead of a token machine she has a chest way off in the corner that says 'tokens'. What tickled me the most is on the wall are chests full of 'toy prizes' and 'food' and on the counter is a chest that says 'two tickets' full of flower prizes. And a little comment about myself. I honestly could not pass a chemistry test put in front of me at the moment. I am halfway mixed-up in physics unless I dive into it for a while first. I am fairly good at math - but last time I went through the steps I broke up at dividing polynomials and I am still offended by that... need to find more resources and smack that tetherball hard until I figure it out. But I feel I have no time...or at least none that will be usefully applied to this when there are so many other things that are pressing. But, my brain won't shut up. I dust vanities at work and out of nowhere I am compelled to find out what actinides have to do with paramagnetism. I solve a garden hose adapter problem for someone and the phrase 'green gallium' comes up...then before I know it I am propelled into indium gallium superconductors at the same time there are all these interesting articles about them (which I had not even seen hair of before that). I woke up one night with some very clear idea of a melting point threshold and reaction with a tin compound that was all written out in front of me like some foreign language. And lately praseodymium crystals, optics and again magnetism are chewing on that same little corner of my brain suggesting words to look up. But the rational part of my brain says 'I don't know anything about this!'. The real question is - I obviously know (at some level) something about this, and I am just refusing myself time to study it, because it feels like 'chasing butterflies.' What is the answer to that? I don't know... and Esme comes bounding up the stairs and asks to play games. We are gathering a bit more for Esme's geology science next year - a ten dollar microscope, some gemstone slice samples and crystals - at the same time we ordered a few little things I wanted for my birthday coming up, including an aluminum easel for upright painting. This is the first year in a while I have not asked for that specific day off- because my vacation was used up earlier in the year's snowstorms. I could have asked for it unpaid - but it just didn't have the urgency with my tooth exam already being the Monday before (and unpaid off) I hope I will still be able to keep my tradition of getting up to see the sunrise...but it is possible that I may have to be to work by then and miss it...the schedule drops in a few days and I will know. Things might change a bit after the surgeon looks at my teeth, as well. I bought Esme a set of jacks (rubber though, not metal) and we looked up how to play again - I will state the variations we played when I was a child. We would bounce the ball and try to pick up as many as we could from the center pile without knocking any others out of position or dropping the ball or any jacks. We could not drop or catch the ball with the opposite hand - we had to drop, scoop and catch all before the ball bounced again. The other variation was the onesies, twosies, threesies etc.. where you see who can grab the listed number of jacks in order, and proceed along until someone gets to five, six or your maximum # of jacks. But, mostly we played the scoop version - and the pile dwindled, and whoever had the most at the end of the group won. There is a lot of thinking, pre-planning and execution in the game that you don't think about until you are trying to play well. Esme got consistently better as we went along -but both of us were losing the ball and chasing it across the floor often. Mark says we should find some metal ones and a wooden ball and compare the difficulty. This was a little 2.50 set that was at a pharmacy store on display and I thought it would be cool to teach Esme to play. We still have to find a decent marbles set, too - as that has similar thought processes. We went to Mulberry Park today, in McKenzie, TN and met up with some friends. Esme wanted to take pictures of the ducks, and to feed them. We went for a little ice cream afterwards and to play for a while. M4817 McCalls multilayer sundress pattern. I intended to cut out the size 6, but some of the pieces for the top were closer to the size 8 - so I might need to add a pair of ties to the back to keep it from being the tiny bit gappy while she grows. I reduced it by one layer, and also pleated it, instead of gathering it..because I 'roll that way' when I sew. I hate to gather the fabric first. The pink fabric was something she had chosen years ago for pants and I couldn't quite bring myself to work with it (eye searing)...but a matching pair of shorts for this might be doable now that this turned out so well. She added the silk flower. She is uncanny sometimes....I had just been looking at that spot and wondering what to do with the little bit of ugly stitching that had happened at that spot and she was at my elbow with the flower a friend gave her today. I do worry a bit how well that part will wash...but we'll see. What do I hear all the time, now? 'Speaking of xxxx, ......goes on with some question or comment'. I can directly trace that to Gadget the mouse from Rescue Rangers. :) Ha! It has been a long week - I finally get a day off tomorrow. We went out for a few groceries today, and I showed Esme what a rutabaga looks like. I brought one home and had her watch me peel it and cut it up - put it in an oven dish with a little water and olive oil and sprinkle spices on it. Then it went in the toaster oven on bake for an hour. I'll take it to work for my supper, with the rest of what we had cooked the other night. When we checked out with it (and all the rest of the groceries) the cashier said she had never seen one before. Esme said it smelled nice.. but I won't have her eat it this time around (and I really do want to eat it! )...Mark has planned porkchops for their dinner tonight and she already had lunch. She wants to go to the park tomorrow -and I did promise if the weather is good. She wants to see if the ducks are there yet. Her other ideas were all a bit much -- go to Kentucky Lake (it is not yet warm enough) and swim, go to the roller rink.. and we had talked about going to the Land Between the Lakes homestead sometime next year. We were reading the next few chapters in Little House and they baked bread, made butter, made bullets for the hunting alongside their father, and are getting ready for Christmas. I started and finished Call of the Wild again, had forgot a few bits here and there - like when the sled goes through the ice just after Buck was rescued. I need to download a few more of those free books.. as I have worked my way through quite a few of that era lately...brings back memories as many of these books were in my brother's classics collection or cast-off at library sales at the time I was really wanting things to read as a kid and had very few in the house. I know reading so many books of that era-1850-1940, effected the way I grew up, and what I came to value.. I have been sort of saving Dora Deane for a while - reading the others by the authoress that I had not known existed before... that was a quarter book from the library when I was nine or ten, and I read it although it may have been a little 'old' and romantic for me at the time...I likened little Dora to the matchgirl in the fairy tale that dies in the cold, except she was rescued at the last moment. I finished Homestead on the Hillside and the English Orphans by her recently, as well as the Rice Corner pair...and told Esme little bits out of them that were the most memorable. I have some Horatio Alger (the other side of the coin, poor boys work hard and make their fortunes) downloaded, and am working towards finding the rest of the Tarzans and Princess of Mars series, as well.